Sports are an integral part of the American way of life. People gather together to watch their children play sports and sit in the grandstands to watch their favorite team battle against their opponents to retain world class titles. It seems only natural that a sports-themed party is the way to go for sports enthusiasts. There are two types of sports-themed parties. One is where you actually play the sport in question and then either have food and drinks available at the sports venue, and the other is where you decorate a venue with sports-related decorations. Either one is a great way to celebrate a birthday or special sport event such as World Cup playoffs or Super Bowl Sunday. Sports-themed parties can be for football, soccer, tennis, golf, baseball, basketball, Nascar racing, Summer Olympics and even Cheerleading. Almost any sport can be the focus of a party. It’s all about creating the theme around the sport of your choice. Planning a sports-themed party begins with choosing the sport or sporting event. Once that is established the next thing to do is to select invitations that have a sports-theme. The invitations could be shaped like a football or other sports ball or sports-related images on them. When guests receive their invitations it will be clear what the theme of the party is. If you really want to take the party over the top then ask your guests to dress in relevant sports clothing. Guests at a cheerleading-themed party can wear cheer leading outfits and to make it even more fun get the men to dress that way too. For a football themed party both the guys and the girls can wear football gear. For a Summer Olympics-themed party suggest your guests dress in the sports clothing of the Olympic sport they enjoy watching the most. The décor, decorations, party supplies and music can also be sports-themed. 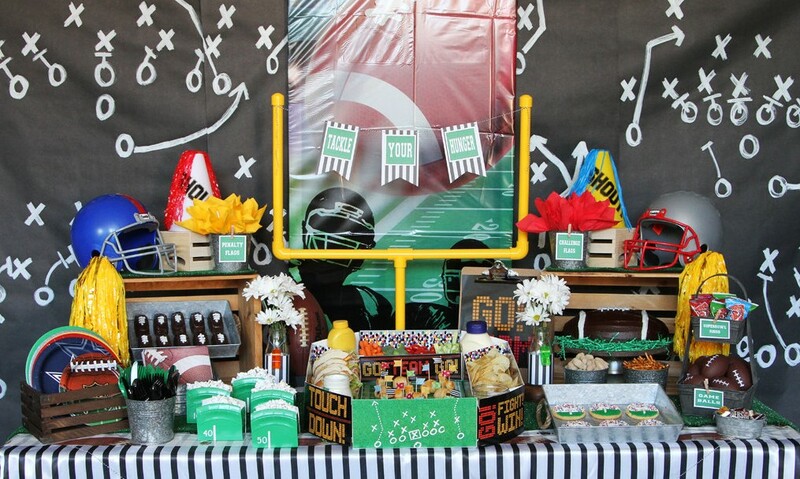 There are plenty of sports-themed party supplies available for just such an event. Decorate with sports team colors. Streamers in team colors can be used to brighten up walls and ceilings. Paper plates, plastic cups and serving ware can also be purchased in team colors. Some sports lend themselves well to particular snacks. Take baseball for example. Everyone expects to have hotdogs served at a baseball party, but you don’t have to limit yourself to just hotdogs. Get creative with other snacks that you think your guests will enjoy. If you are struggling for ideas you can take old sports balls and cut them in half, line them with food grade plastic wrap and serve snacks in them. If your sports-themed party guests include children make sure there are plenty of things for them to do while the adults sit around and talk, drink and have their own brand of fun. One thing that is often fun for children is face painting. The children can have one side of their face painted in one of the team colors and the other side painted in the other team color. While face painting is traditionally for the little ones adults might like to join in this fun activity.